The Carrera Vengeance bike features a 22” frame, 24 gear SRAM shifters, and consistent gear change supported by Tektro mechanical disk brakes, making for a smooth, consistent ride, no matter where you are mountain biking. The great braking system is also going to make for easy stop and go when you need to brake in a sudden instance, and kick back up right away when you continue on your trail. The lightweight frame, Suntour suspension, and quality build will allow riders to continue on their path without slowing down or losing stride. 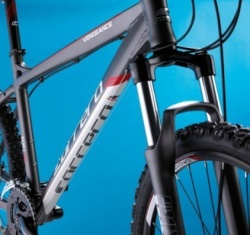 Suntour XCM -V3 forks for exceptional suspension and a smooth ride on any trail. the metallic frame contrasts with the colors, making for a great looking bike, solid design, and designer quality which riders are looking for. Not only does the Carrera mountain bike ride well and offer the ideal suspension for mountain bikers, but the design and style is also something bikers are going to enjoy. in order to shift the gears, you have to be pedalling very hard, which can make for a difficult ride when you are trying to get to the next level up. Although there are a few drawbacks, bikers are still going to enjoy the overall ride and design when they choose this bike. Regardless of what you are looking for, how often you ride, or what kind of trails you ride, the Carrera Vengeance Mountain Bike is a great bike for you to consider. Although there are a few drawbacks, and shifting gears can take some getting used to for a few bikers, it is still going to offer bikers optimal performance, solid construction, and a great looking bike when they are ready to choose a new bike. 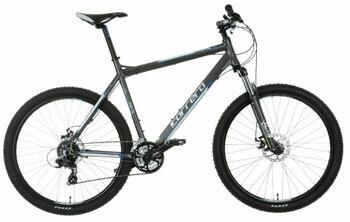 Find more reviews about the Carrera Vengeance Mountain Bike at Halfords here. Have one of these and been riding it for 11 months, took the heavy front forks and replaced them with suntour raidons from a banshee,Much better forks for xc and ive hit a few downhill berms and its been great,Mine is the 16 inch frame which suits me better as the crossbar is well lower which shifts the centre of gravity and the bike handles well at 45 degrees thru corners.